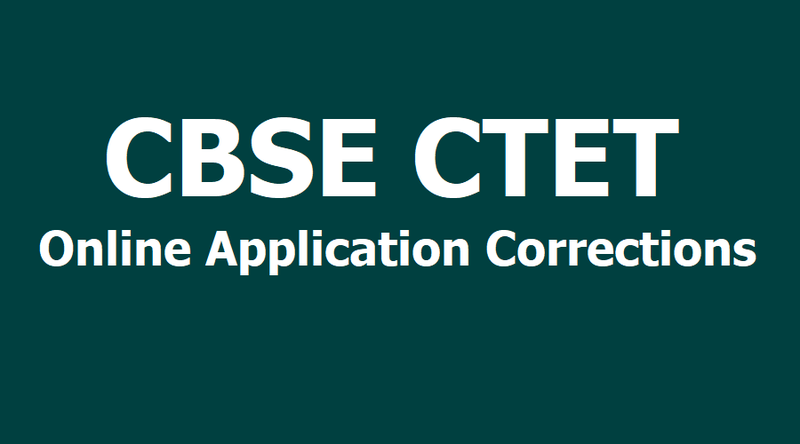 CBSE CTET 2019 application correction process begins @ ctet.nic.in. CBSE CTET 2019 application correction process end on April 7, Check your CTET Online application Details and Make correction if any till April 1: The Central Board of Secondary Education (CBSE) will start the online application correction process for the Central Teacher Eligibility Test (CTET) 2019 form March 26. All the candidates who are appearing for the CBSE CTET July 2019 can make changes in the form by logging on the website, ctet.nic.in. As per the schedule released by CBSE, the online correction window will be available till April 7, 2019. CBSE CTET 2019 application correction process extended to April 7: The Central Board of Secondary Education (CBSE) has extended the last date to make correction in the Central Teachers Eligibility Test (CTET) 2019 application form. All the candidates may make online corrections in their particulars upto April 7. Meanwhile, the 12th edition of CBSE CTET 2019 will be held on July 7. Correction process in CTET 2019 Details: "The candidates shall be permitted to make online correction with their respective-- name, father and mother name, date of birth, category, differently able category, Paper opted (Paper I or Paper II), Subject for Paper II, First choice of Centre, language I and/or II opted, Address of correspondence and the name of the Institution from where the candidate has obtained their BEd Degree or Diploma in Elementary Education etc," read the official notice. The 12th edition of CBSE CTET 2019 will be held on July 7, 2019. All candidates may choose/change their examination cities as per their convenience. The candidates may opt any three (03) examination cities in their preferential order. Further, the candidates who have earlier selected Patna, Muzaffarpur and Guwahati are specifically informed to modify their choice of examination cities from the new list of examination cities. However, in case of still more number of candidates in these cities, the candidates may be allotted their second/ third choice of examination city or any other city in the possible nearby area. 1. Candidates need to make the correction by logging on the official website ctet.nic.in. The link is now active on the home page. No offline requests would be entertained for the same. 2. Candidates cannot change their mobile number of email address provided at the time of the registration. Also, candidate’s particulars can be changed during this time, including the quota the candidate has applied under. 3. Online corrections can be made in name of the candidate, father and mother name, date of birth, category, differently abled category, Paper opted (i.e. Paper I or Paper II), Subject for Paper II, First choice of Centre, language I and/or II opted, Address of correspondence and the name of the Institution/College/University from where he/she has obtained his/her B.Ed Degree/Diploma in Elementary Education etc. 4. Also, the fee once remitted shall not be refunded or adjusted. The candidates are hence requested not to make any requests thereof. 5. This is the last chance for candidates to correct the information provided in the application forms. 6. Any changes notified at the time of result would not be entertained. An error in the spelling of the name would also not be entertained beyond April 1, 2019. Central Teacher Eligibility Test, CTET 2019 online applications closed on March 14, 2019. Candidates who have applied can now check their applications and make corrections if any. The correction window for CTET 2019 started on March 25, 2019. Candidates can login on ctet.nic.in and make corrections till April 1, 2019. All the candidates are informed that the opportunity to make corrections would not be allowed after April 1, 2019. The admit card would be released in the month of June. Central Board of Secondary Education, CBSE would be conducting the CTET 2019 examination on July 7, 2019. Important instructions are provided below. Note: In case confirmation page is not generated after depositing the requisite fees, the candidate should approach the Joint Secretary (CTET), CTET Unit, CBSE between 10:00 A.M. to 5:00 P.M. from 25-03-2019 (Monday) to 01-04-2019 (Monday) along with proof of payment of fee i.e. candidate copy of E-Challan, if payment made through E-Challan. The candidates shall be permitted to make online correction with their respective-- name, father and mother name, date of birth, category, differently able category, Paper opted (Paper I or Paper II), Subject for Paper II, First choice of Centre, language I and/or II opted, Address of correspondence and the name of the Institution from where the candidate has obtained their BEd Degree or Diploma in Elementary Education etc. The CTET 2019 admit card will be released by NTA on its official website before the date of examination. Candidates will be able to download their admit cards only from the official website of NTA. CTET examination is conducted by CBSE for the eligibility of candidates interested in taking up teaching jobs in central schools and Kendriya Vidyalayas. CTET score is also accepted by a few states. For the criteria of recruitment, however, candidates are advised to check the respective state boards. Also, CTET score is valid for a period of 7 years. CBSE is responsible only for conducting the examination and releasing the eligibility certificate. CTET is only a qualifying and eligibility test and does not relate to recruitment. Candidates who qualify CTET are required to then apply for respective teaching jobs.